Writing content is great, but if you aren’t promoting your content, then what’s the point? People need to find the great pieces of content you write. One way to give your content a boost is by posting to social media, so we created a fully integrated social media module right in DSS™! Tip: You should absolutely be sharing your content on social media, but don’t limit yourself! Consider sharing other post types, like pictures, videos, and more personal updates. Check out this article to learn how to create a social media strategy. People love statistics and data! Back your argument up with reliable sources of information, using statistics to create eye-catching headlines and descriptions. Choose topics people care about that will bring you new business. Do you think someone is more likely to read a blog post about “How to Prevent a Car Accident,” or “What to Do After a Car Accident?” The first topic requires your readers to have the foresight to realize they need this information. The second topic answers the question of readers you would want to connect with because they have actually been involved in an accident. Stay relevant. While it is great to post about your followers’ interests, it is also important to make sure your posts are relevant to your business. Remember, your social media audience is following you because they like the information and services you provide. 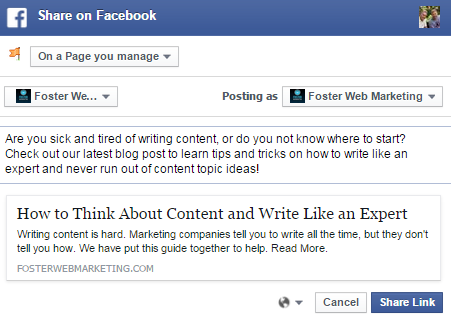 Click the social media button that corresponds to the social media site you want to share your content on. You will be prompted to sign-in to your social media account. Once you sign-in to your business’s social media account, you are almost ready to post. Be sure to select your business page to avoid sharing to your personal social media account. You will see a square on the top left that says “On your own Timeline.” Click this dropdown menu and select “On a page you manage.” It should default to your business’s page, but if you manage more than one page, you must select the correct option from the dropdown. Once the proper page has been selected, take the opportunity to say something about the content piece, but don’t make it too lengthy. You just want to say enough to entice people to click the link. Tip: If an image doesn’t appear with your link, try refreshing the page. Facebook is notorious for caching issues; they are slowwwly working on this glitch. Sharing on Twitter is even easier than sharing on Facebook because you have a separate login for your business page’s Twitter account. Just click “Share on Twitter,” compose your tweet, and share it! Don’t forget to use hashtags to improve the reach of your Tweet. Try to keep your tweet around 110 characters; if you are maxing out your tweet character count, it will be hard for others to retweet. Tweets around 110 characters get a 17 percent higher engagement rate. LinkedIn offers one great feature that other social media sites don’t offer—the ability to tailor the headline and Meta description to your target audience. You can also post to individual groups, send to individuals, or share privately. In most cases, you will just share an update, but don’t ignore an opportunity to use the other features when it makes sense. 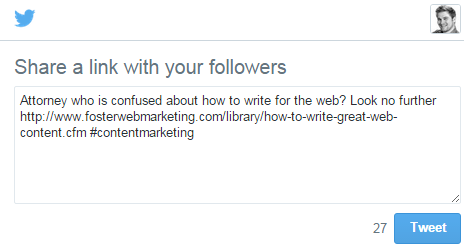 You can also tweet your LinkedIn update to Twitter by clicking the Twitter box. However, if you tweet from LinkedIn, we recommend creating a unique post for Twitter instead of reusing your LinkedIn update. Currently, you can only share to Google+ through your personal Google+ page. However, once you share on your personal Google+ page, you can re-share the post from your business page. When you share, be sure to include a comment on your post to engage users. This comment is very important because Google may use it to index your post, thereby attracting more people to your site. 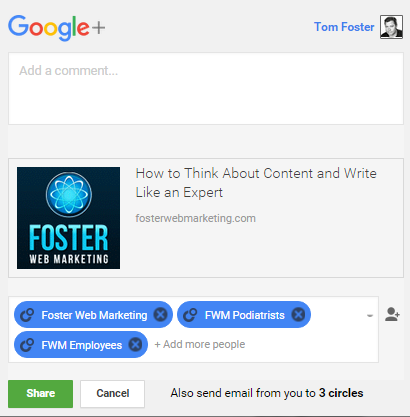 If you are taking advantage of the Google+ feature that allows you to create different circles, choose the circles that make the most sense to share your content with. In most cases, you will want to share to all circles. Step 3 – Check Out Your Social Media Statistics to See How Your Posts Are Doing! Once you find your page, click the “See Your Social Media Statistics” button, and you will see all of your social media statistics for Facebook, Twitter, LinkedIn, Google+, Pinterest, and StumbleUpon. If you played your cards right, your content could go viral like the piece shown below did. Now that you know how to share content directly from DSS and then review your social media statistics, you will be able to better promote your content and see what’s working. Remember, social media is a platform designed to help you make connections. So be social, engage with other individuals, groups, and businesses, and share different kinds of content. Be sure to keep your posts interesting so that your followers will remain interested and continue to follow you. Are you ready to learn more about social media? 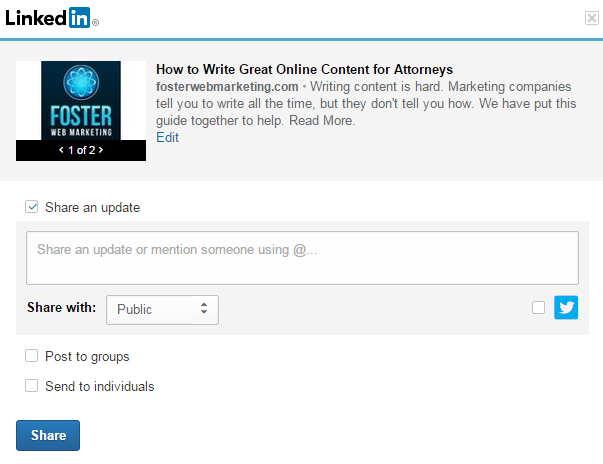 Download our free book Social Media for Attorneys That Finally Gets You the Cases You Want. And if you don’t have DSS, but you want to learn how our social media module and other great tools can help you push your business’s marketing to the next level, request a free demo of DSS. We will schedule a time to show you everything DSS has to offer and explain how this amazing tool can help you market your business more effectively.